Tom Marosz’ drive to test the limits of manipulating light began early on; teenage interests in photography and optics yielded early holography projects. His efforts were deemed so cutting edge during the 1960’s that he ended up collaborating with the Navy Electronics Lab team in Point Loma. After 15 years in the construction business as a glazing contractor, doing what others said you could not do, Tom turned to art using his cold working, cutting and polishing skills to create the glass sculptures you see here. 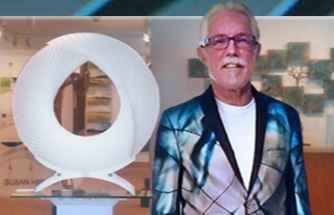 Many of his current works are created using optic crystal, dichroic coatings and kiln fusing. Tom’s broad skill set has enabled him to create a number of large scale installations. The Vantage Pointe sculpture, a lit glass winged water feature standing over 18′ tall, is stationed at the entrance to downtown San Diego at the corner of 10th and A Street. Another, created for the Law School of British Columbia, spans 4 stories and features 450 suspended glass spheres. My art is the culmination of some of the best and worst times of my life, combined with the mastery of skills, craft, and the attempt to manipulate light in ways that no one expects. My fascination with light has been a lifelong passion that is evident in every piece I make. When I start a new piece my desire is to control the light, and therefore the appearance of the piece, in a way that beckons you to see more around the comer and surprises at each tum. Much of my artistic journey stems from my desire to produce pleasing shapes that flow, reflect and refract the light like that little spot on the horizon that catches your eye, making you keep looking back to watch it dance on the edge. Glass is it as far as I’m concerned. Love it. One of the most interesting materials in the universe, it is structural yet fragile, transparent or opaque, seemingly unaffected by time. Albeit incredibly tedious at times, the process of grinding and polishing glass is meditative for me. l can turn up the jazz, turn off my brain and just go … reassured in the back of my mind that what was once just a pile of sand will become a shimmering gem sitting proudly in someone’s home. It does make me smile. One of my favorite things to play with is the manipulation of negative space. Quite a powerful element when used correctly. Often it is the major element that explains the “story” of my sculpture; most notably, my “Tear For Henry” which I dedicated to my father. I have learned that inspiration can come at the most inopportune times in life, and you just have to let it flow through you. Some pieces are a direct reference to an exact moment in my life, while others are reflections of finely tuning my craft, exercising painstaking detail, and attempting absolute perfection of the process. I strive to incorporate new processes into my work that no one else uses or sees fitting to make art with. Investigating the possibilities I see in glass keeps my blood flowing and my brain ticking! My hope is to share that energy with each sculpture I put into the world.